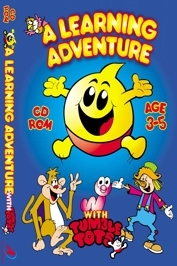 The material on the CD ROM is designed to encourage learning through play for children in the 3-5 age range, when children start to use computers more widely. In terms of the National Curriculum, this is the foundation stage (ages3-5), covering immediate pre-school and reception year children. The Aim of the CD-Rom is fun, but it has been designed with educational aims in line with the 'Learning Journey' as defined by the National Curriculum for the foundation stage, focusing in particular on the 'physical development' aspect of the curriculum, supported by games which develop key skills for preschool children. In order to ensure the educational integrity of the project, the material has been developed in association with curriculum advisers in maths and literacy. Tumble Tot is your guide throughout, providing simple voiceover instructions to each of the games. There are no text instructions on screen, so no reading is required. All the instructions are by voice only. Four simple icons are used for navigation. The songs are designed to encourage children to participate. The intention is that the child steps away from the comuter and joins in with Tumble Tot to do the actions. Each animated song is accompanied by a suite of interactive activities and games. With each song is the facility to print out a black and white outline of the scene for your child to colour in. Each song also has a nursery rhyme, with words highlighted by the Tumble Tot to encourage active partipation. The games can be seen as building blocks to learning. Some contain different levels to encourage development. There are 3 games suites, each headed by a character from Tumble Tots, and including Tumble Tot himself.